P.A.R.C.S. – DuPont, a 501(c)(3) non-profit, was incorporated October 2017, in the City of DuPont by residents; Melanie M. Stone, R. Suzette Frederick, and Jessica Fester. We came together as a group of DuPont residents willing and able to put forth the time and effort to bring additional recreational facilities and programs to the City of DuPont. PARCS is dedicated to maintaining a high quality of life for residents of DuPont and beyond; our purpose is to enhance the City of DuPont’s recreational services, facilities, and programs through strategic Partnerships Aligning Recreation, Parks, and Community Services. PARCS is working collaboratively with the City of DuPont, and their goals are consistent with the strategic views of the Parks Master Plan. 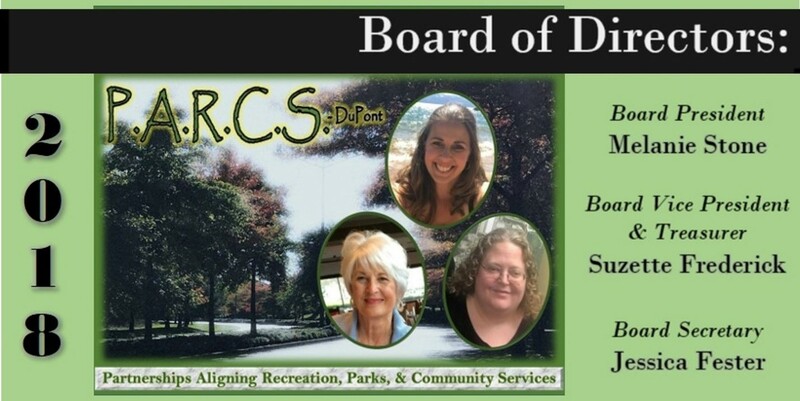 The resources of PARCS are NOT intended to replace or substitute revenues generated for the annual ongoing maintenance activities for the City of DuPont’s Parks and Recreation program or the Parks and Recreation Agency. However, PARCS may provide funding to the city through its grant program. Amy Walker, Recreation & Events Coordinator for the City of DuPont, has been named as official liaison to PARCS. To volunteer your time, or to make a tax-deductible contribution to support the mission of PARCS, please contact one of the Board members listed below for more information. All of PARCS transactions will be made available to the public for transparency of operations.